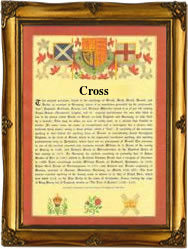 Recorded in several spellings including Cross, Crosse, du Cross and Crossman, this is an English surname. It derives from the pre 7th century Old Norse word "kross", which in Middle English comprehensively displaced the Olde English form of "cruc". As a surname it has several possible origins. The first is that it may have been topographical for someone who lived near a stone cross set up by the roadside or in a market place. In a few instances the surname may have been given originally to someone who lived by a crossroads, but this sense of the word seems to have been a comparatively late development. Finally, in other cases the surname may have denoted one who carried the cross in processions of the Christian Church. Early examples of the name include Richard del Crosse, recorded in 1285 in the Assize Court Rolls of Lancashire; and Phillip Crosman of Somerset in the Subsidy Rolls of that county in 1327. John Cross, aged 18 years, was convicted of being a Monmouth rebel and was transported to the Barbadoes in 1685. His final fate is not known. The first recorded spelling of the family name is shown to be that of Humfrey de Cruce. This was dated 1273, in the "Hundred Rolls of Oxfordshire", during the reign of King Edward 1, known as "The Hammer of the Scots", 1272 - 1307. Surnames became necessary when governments introduced personal taxation. In England this was sometimes known as Poll Tax. Throughout the centuries, surnames in every country have continued to "develop" often leading to astonishing variants of the original spelling.